Soppec Reflect Light Aerosol can be applied to a number of different surfaces, including Steel, Timber, Masonry, Plastic and previously painted substrates, in order to produce a highly reflective coating. Soppec Reflect Light Aerosol is a clear light reflective paint coating that illuminates when it is subjected to a light source. Reflect Light can be used for both safety and decorative applications. Reflect Light can be applied onto most substrates such as steel, timber, masonry, plastics and previously painted surfaces. Soppec Reflect Light Aerosol is part of Promains selection of quick drying, super effective street furniture coatings. Soppec Reflect Light Aerosol is suitable for many uses such as highlighting bollards, railings, barriers, fences and gates. Soppec Reflect Light Aerosol can be applied to a number of surfaces that are exposed to a light source, and will illuminate when subjected to it. Soppec Reflect Light Aerosol is suitable for applying decoration to a substrate but is intended mainly for safety purposes and works best in the dark to provide a reflective coating. Soppec Reflect Light Aerosol is quick and easy to apply. Simply shake the can until the mixing ball is heard and apply the product by holding the can approximately 25 cm away from the substrate and using a back and forth motion while shaking frequently during use. Soppec Reflect Light Aerosol can be applied to a number of different surfaces, including Steel, Timber, Masonry, Plastic and previously painted substrates, in order to produce a highly reflective coating. Soppec Reflect Light Aerosol is ideal for use on steel furniture than can often be hard to see in the dark and reflects any light source more efficiently than the natural steel substrate would or other conventional decorative paints. 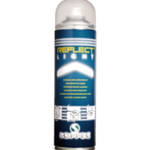 To improve the longevity of Reflect Light, it is reccomended to protect it with a clear top coat.